QinetiQ’s Paramarine Ship and Submersible Design Software has been selected by Newport News Shipbuilding (NSS) as its primary naval architectural software. QinetiQ Paramarine Software will be used for all ships designed and built at its shipyard, including use on the US Navy’s latest class of aircraft carriers and to support submarine research and development. 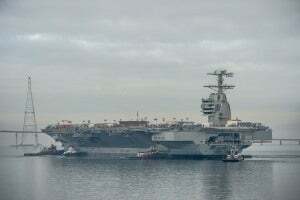 As the sole designer, builder and refueler of U.S. Navy aircraft carriers, and one of two providers of US Navy submarines, Newport News Shipbuilding is currently building the new FORD-class aircraft carriers and VIRGINIA-class fast-attack submarines, and performing refuelling and complex overhaul on NIMITZ-class aircraft carriers. QinetiQ Marine Design software managing director Vittorio Vagliani said: "We are very pleased to have been selected by one of the world’s leading naval ship and submarine builders. The selection of Paramarine software by NNS is a massive vote of confidence in the power and flexibility of the software. We look forward to working with NNS."